Cathedral Rock is a massive haystack formation at the base of Face Rock Lookout in Bandon, Oregon. It is hollow with window and door openings. The cave can be explored at low tide. This day there was a king tide with the ocean gushing through the cathedral, almost covering the beach and leaving lacy froth as the waves receded. The clouds mimicked the pattern of the lace on the beach. 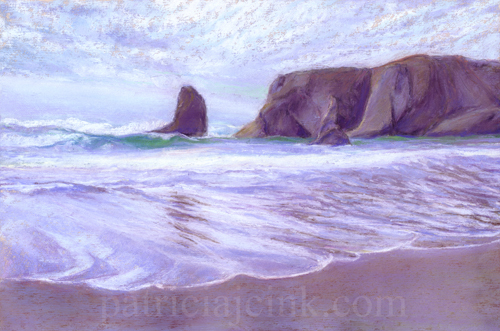 Cathedral Rock has previously been the subject of two of my watercolor paintings, Cathedral Rock Window and Cathedral Rock High Tide. In this painting the pastels worked well to capture the lacy patterns of the scene.